Synthesis, healing, and moderation are all themes of Temperance, and it’s time to take stock of how these concepts could create a better sense of wellness and fulfillment in your life. Are there things you are doing too much of that you would do well to tone down? Is a lack of balance in your eating, exercise, or self-care causing you illness or discomfort? Are there elements of your life that are out of sync with each other that need integration? Take some time to evaluate what needs balance in your life and, if needed, get some help to find your way forward to healthy integration. Not only will you feel better, but you’ll get some peace of mind in the mix. Jacki has a beautiful way of blending many things into one unified whole. As a massage therapist, she uses traditional massage, reiki, reflexology, gua sha, cupping, stone work, essential oils, sound healing, and bodywork to help her clients get a truly holistic healing experience. Jacki’s talent is knowing when just the right thing is needed, and bringing it into the session as the client’s needs arise. I can go in with a cold and a 60 hour work week that’s wreaked havoc on my shoulders, and after an hour of oils, rocks, reflexology, and reiki I leave a new woman. With about 30 years of experience, Jacki knows how to perfectly blend each modality in a beautiful flow that addresses all of the parts of us that need healing. There are so many talented massage therapists in our city (many of whom are also my friends), but in my experience this level of successful integration of so many modalities is unheard of. And it’s the perfect expression of Temperance’s magical ability to mix the right elements for healing. Finding that perfect blend of persistence and compassion is a challenge for anyone on any topic, and Jacki is always on a journey of integrity and balance in her work, finding a way to blend the grace of acceptance with the fervor to fight on. This sort of integration of elements is, I feel, a hallmark of Temperance. 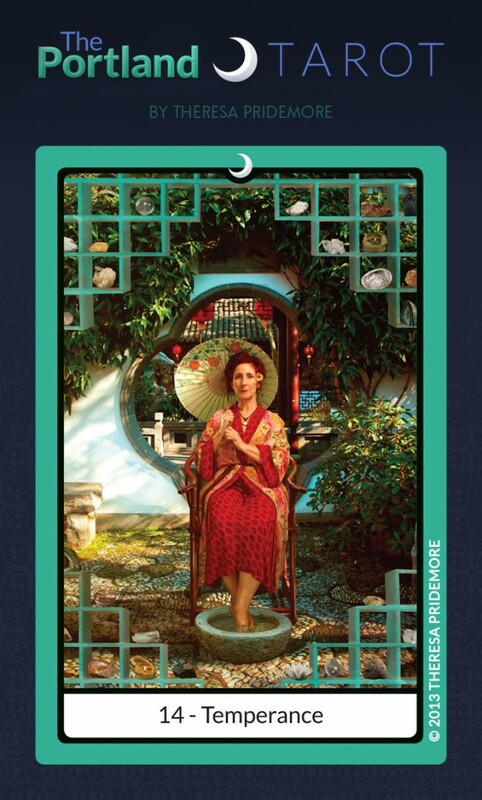 Of course, her added connection as a former alcohol and drug counselor is such a literal connection—a call for Temperance in our use of substances, and the need to work through the challenges that come with healing a history of substance abuse—that it felt certain to me she was meant to be in this card. For this image I wanted to put Jacki in a serene environment—what better place than the Chinese Gardens?—and to include visual elements that honor the four elements in the process of her healing work as a massage therapist. Oils represent both air and water, being liquids that create fragrances carried on the air; candles are fire; seashells water; and stones are earth. Jacki wore her favorite robe for this shot, and there is a beautiful sensuality to the image that I think also honors her role as an advocate for healthy sensuality and self-care for women in her age group. She is serene and at peace, and instead of the usual mixing of cups found in the Rider-Waite, she soaks her feet in a bowl of water; her mixing and integration happen within. Beyond all of this, Jacki has a special connection to me personally, in that she is a great maternal figure in my life—something I really appreciate since the passing of my own mother in 2001. There are a lot of fun and healthy connections between Jacki and my mother, and I often feel like my mother put Jacki in my path to be with me in a way she couldn’t—it’s even more potent to me that she has experience helping people who have struggled with substance abuse and understands the complications of this for individuals and their families, as this was the primary struggle for my mother prior to her passing. I’m delighted Jacki agreed to pose for this card and create such a lovely and powerful image for Temperance, and to share this creative experience with me. Follow the project, get access to special discounts and a free desktop wallpaper! 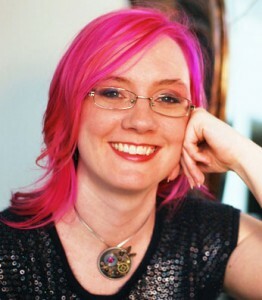 Plus cool Tarot tips and intuitive insights from Theresa. Now, put that in your pipe and smoke it. "Theresa is to Tarot what Pink Martini is to Music, Darcelle is to Drag Shows, and Storm Large is to Badassery - a true Portland original." 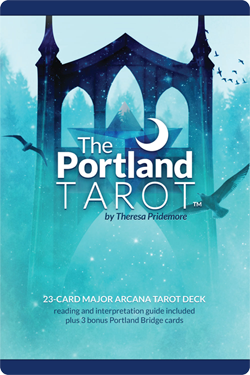 Follow The Portland Tarot's board The Portland Tarot Major Arcana on Pinterest.